Kingston is a rural township 7 km north-east of Creswick and 100 km north-west of Melbourne. 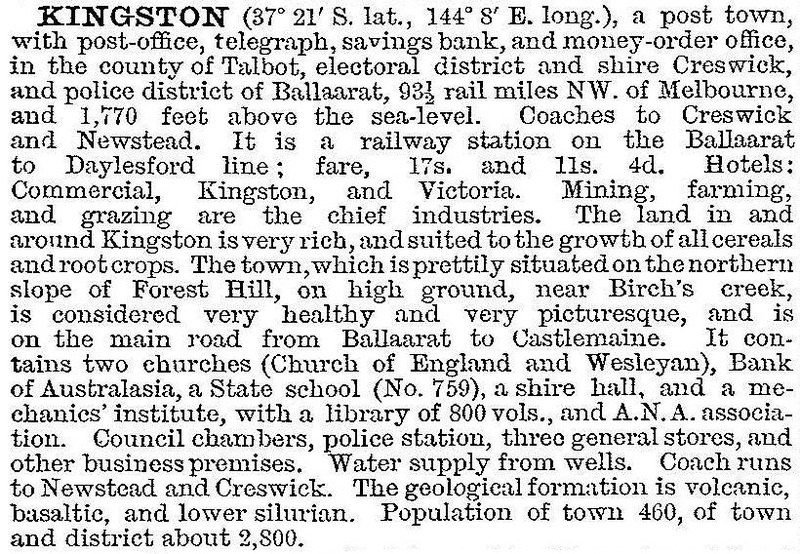 Kingston was beyond the alluvial gold mining in the Creswick district during the 1850s-60s, and just to the east of the deep lead mining which started with the Spring Hill lead in the 1870s. It was like Smeaton, providing agricultural land for cereals and grazing. A flourmill was built in Kingston in the early 1860s. A school was opened in the mechanics' institute at about the same time. (In nearby Spring Hill an Anglican school was opened in 1857.) Kingston was also the administrative centre of Creswick Shire until about 1948, 14 years after Creswick borough had been united with the shire. Deep lead mining ended during 1910-20. In 1919 an Avenue of Honour was planted along the Creswick-Newstead Road towards north Creswick, symbolically uniting the two municipal centres. The Smeaton, Spring Hill and Bullarook agricultural society (dating from 1859) ran one of Victoria's most successful annual shows. In 1921 it was decided to move the showground to near a railway station. Allendale was chosen in 1921, but a permanent move was made to Kingston the next year. A substantial pavilion and buildings were constructed at the new showground. Kingston has survived the passing of gold with more than a scatter of buildings. The former shire hall, Anglican church (1864-1964) and Wesleyan chapel (1868) survive as private residences. The old railway station (1899), a nearby chaff mill (1898), the hotel (1905) and former school (1881) with bichromatic brickwork are historically interesting buildings. There is also a cricket ground, tennis courts and extensive potato growing by irrigation. Water is reticulated from the Newlyn reservoir. The school closed in 2004.